Gajorer Payesh/Carrot Pudding | Happy Diwali! Happy Diwali to all of you! May the Indian Festival of Lights brighten up your lives, illuminate your homes and your minds. May Health be there… Happiness will follow. May Peace be there… Prosperity will follow. May Love be there… Luck will follow. Today’s recipe has been lovingly cooked by my Aunt who’s been visiting us for a while. While she left for Kolkata two days back, she cooked this special Gajorer Payesh/Carrot Pudding and put it in the freezer so that we could have a special dessert for Diwali! Festivals all over the world have the same essence – they bring families and friends together. A small excerpt form an earlier post Semaiya Kheer/Vermicelli Pudding, Eid in Dubai… Eid Mubarak!… While a lot of us living in Dubai are lucky enough to be with our friends and family, many of us are not. There are many people toiling in the city just to earn a living so that their loved ones can have a decent life back in their home countries. My greetings and warm wishes to all of them. Most likely, my wishes are not going to reach them I doubt that these people are going to read my post. Writing food posts while taking photo-shots of them in well laid out dining table in the air-conditioned comforts of our humble home, may seem preposterous to some. But I was awake to greet Eid Mubarak to the man who delivers the newspapers daily as early as 3 am in the morning, throwing out the newspapers as he stands inside the lift, aiming them perfectly as they land in-front of the main doors of the different apartments in the floor that we live in. At the time I had greeted him, he had 30 more floors to go! This time I woke up early to greet him for Diwali. It didn’t matter whether he’s a Muslim or a Hindu, whether he celebrated Diwali or not. My greetings are as much as for him as it is for everybody. I’ll be greeting him during Christmas. For me what matters is that Festivals give us an opportunity to reach out to people who are there in our daily lives but to whom we don’t have the time to reach out at other times. Every day can be the day but today is definitely the day. Happy Diwali everyone! Gajorer Payesh is not Gajjar Ka Halwa! Why is this a Bengali Fusion Dessert and not a traditional Bengali recipe? Gajor or Carrots have probably now entered into Bengali desserts but predominantly it has been Gajjar ka Halwa which is a very popular Indian Dessert, specially in Punjab. 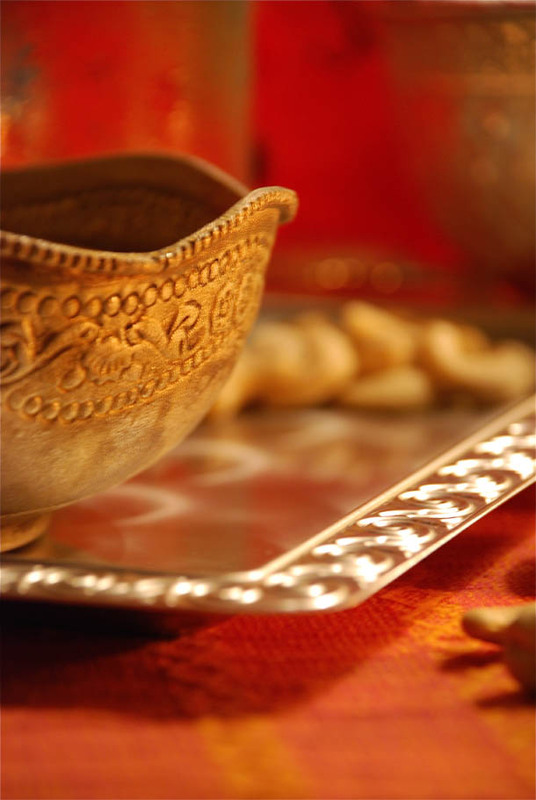 The dish originated from the nut dishes introduced by the traders from the Middle East and South Asia during the Mughal period. In-fact, Halwa is an Arabic word meaning ‘sweet’. Vegetables such as carrots, pumpkin, zucchini, potatoes and snake squash have also been used in the Middle East for making similar desserts. Gajjar Ka Halwa is traditionally a festive Indian dessert eaten during Diwali, Holi and other Indian festivals. Eaten smoking hot during the winters, Gajar Ka Halwa is now eaten the year around as Carrots are no more a typical winter vegetable, courtesy hybrid and other farming technology! Payesh in itself is a very important traditional Bengali dessert. The only other way to explain the importance of a traditional Payesh/Rice Pudding is to compare it with Champagne. If you can understand the importance of Champagne to bring in a family celebration then you can probably understand the importance of Payesh. Or say, cutting a cake on a birthday. For a Bengali, a spoonful of Payesh is a must on a special occasion. Also, the first spoon of non-solid food that goes into a Bengali child during Annaprashan or the First Rice is Payesh (for traditional Payesh you may read an earlier post – Notun Gurer Payesh/Traditional Bengali Rice Pudding & My Dida). Let the Gajorer Payesh/Carrot Pudding set for a while and refrigerate it. Serve it cold. However, some prefer to eat their Payesh smoking hot, just after it has been taken off the fire! Rose water was first produced by Muslim chemists in the medieval Islamic world through the distillation of roses, for use in the drinking. Rose water is used heavily in Persian and Mesopotamian cuisine—especially in sweets such as Nougat, Raahat and Baklava. It’s also used to give Loukoum/Turkish Delight their distinctive flavours. The Cypriot version of Mahleb uses Rose water. In Iran, it is also added to tea, ice cream, cookies and other sweets in small quantities. In the Arab world and India it is used to flavour milk and dairy-based dishes such as rice pudding. It is also a key ingredient in sweet lassi/Yogurt Drink, sugar, various fruit juices and is also used to make Jallab. In Malaysia and Singapore, Rose water is mixed with milk, sugar and pink food colouring to make a sweet drink called Bandung. Rose water is frequently used as a halal substitute for red wine and other alcohols in cooking. In parts of the Middle East, rose water is commonly added to lemonade. In Western Europe, Rose water (as well as orange flower water) is sometimes used to flavour Marzipan. Rose water was also used to make Waverly Jumbles. American and European bakers enjoyed the floral flavouring of rose water in their baking until the 19th century when vanilla flavouring became popular. In the United States, Rose syrup is used to make rose scones and marshmallows. Diwali is celebrated in a big way in Dubai and the credit does go to the fact that amongst all the Indian festivals, Diwali has managed to elevate its’ popularity level amongst the non-Indian communities living in Dubai. Probably world-wide! I love the fact that Z-Sisters‘ school celebrates Diwali even though the school follows the British curriculum. This is the very essence of living in Dubai. There are 12 nationalities amongst the 24 students in Big Z’s class! Yes, they will also be celebrating St Andrew’s Day, Christmas, Chinese New Year, Eid and many more festivals around the world. In-fact Big Z’s topic right now is Festivals! Tomorrow, Big Z will be giving a small power-point presentation that Mummy Dear has made on Diwali – the story of Ram-Sita returning home; how Goddess Lakshmi is worshiped; what do the Indians do during Diwali… Both the sisters will be painting on Diyas/earthen lamps along with all the other friends as a part of Diwali activity in school. A friend of mine who owns an Indian Sweet shop in Karama and has her son studying in the same school, will be distributing nuts-free Indian sweets in school. Most schools in Dubai are predominantly adhere to a nut-free policy. And yes, the dress up code for the Diwali day is ‘Indian clothes’! Residential areas in Dubai like the Golden Sands area (behind Burjuman), Meena Bazaar have already brightened up with colourful lights hanging from the balconies. Shikhadi, my very good friend who’s now become a part of our family was kind enough to send a picture clicked from her balcony. Does this look like Diwali is being celebrated in a foreign land, many many miles away from the Indian shores? Diwali will light up our houses. But this Diwali, I pray that the lights brighten our minds and our thoughts as well. Also praying for peace and happiness for people struggling in the war-torn regions all around this region and in the world. ← Frozen Aam Pana/Green Mango Pulp | The Change Initiative! The dessert looks great Ishita! Its a little hard work 🙂 but ill get a few friends to help lol and enjoy this dessert! cheers! Well thank you for putting up the disclaimer about Gajar ka Halwa. Payesh means kheer in Bengali, right ? I have no idea how you come up with such visuals. I mean it looks so… right ! I wish I had a well equipped kitchen to try this recipe. Looks amazing 🙂 Thank you for sharing with us all. Hey thanks so much… happy Diwali to you! What do you mean by ‘well equipped kitchen’? It’s all in the mind. Your kitchen gets equipped according to what you want to cook. Regarding the pictures – we;;, I work on them 24×7… do hop into my earlier posts and see where I was. I’m always reading up on photography wherever I can, specially if some fellow food blogger has shared any thought on photography. Amazed to know that you put in so much efforts in your pictures. They are really good. I did read up a lot of your entries, though not all of them- it is especially helpful to newbies like me. Happy Diwali to you as well Shira… may the Indian Festival of lights brighten up your lives!